If someone gave you the option today to make your home entirely energy efficient, would you do it? What if it saved you a lot of money on your bills? What if it cost you a lot of money? Most people would initially answer yes to the first question. Becoming more energy efficient makes people feel better about themselves, and for good reason: If everyone in the U.S. used energy-efficient lighting alone, without even changing any other appliances or habits, we could retire 90 average size power plants. Helping the environment is usually something people see as desirable, yet it often takes second priority to other factors, like the cost of buying the appliances. When asked the second question, most people would likely say yes even more emphatically than they did to the first. If being more energy efficient is beneficial to people themselves, they’ll probably go ahead and do it. Maybe that’s why in a recent study done by Consumer Reports, 75% of Americans use CFLs (Compact Fluorescent Lamps). CFLs can save consumers up to $60 per year on their energy bill— clearly a good enough reason for many to make the switch. CFLs are spiral-shaped bulbs with fluorescent coating, and inside they are filled with argon and mercury vapor. An electrical current excites the gases, which then produce ultraviolet light that interacts with the fluorescent coating to produce visible light. Unlike traditional incandescent bulbs, in which 90% of the energy required to produce the desired light goes to heat, CFLs are able to produce light efficiently. While CFLs provide people with an attractive way to save both money and the environment, the situation becomes stickier with LED lights. LEDs (Light Emitting Diodes) are semiconductors that produce light when electrons pass through them. They are more energy efficient than CFLs, but they cost more to buy. LEDs usually cost between 25 to 60 dollars each, whereas CFLs only cost between 1.25 to 18 dollars. However, LEDs last up to 50 times longer than incandescent and CFL bulbs, use 36 less watts than incandescent bulbs and 3 less watts then CFLs. Yet of the many Americans that use energy efficient lighting, 75% use CFLs. That brings us to the third question. If switching to a more energy efficient solution is possible but it costs more money than the less energy efficient alternative, the data shows that people will not make the switch. Clearly, Americans prioritize the costs of installing the LED bulbs over their environmental benefits. 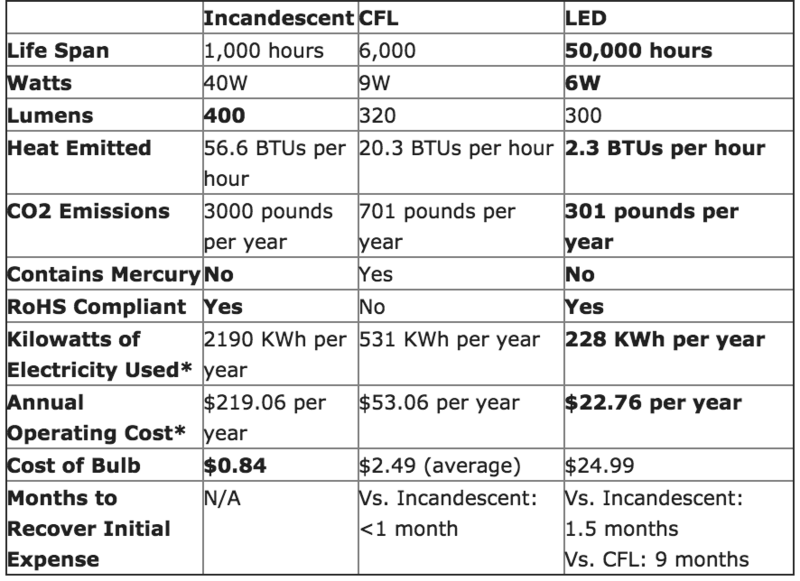 Interestingly, however, LEDs have some economic benefits over CFLs as well. LEDs could save people up to $130 per year on their energy bill, and cost less than CFLs to operate yearly. They do cost more than CFLs and take longer to gain back the investment, but only half a month longer. Sadly, Americans prioritize their economic interests over environmental interests. I think we should all strive to hold the environment at a much higher priority than we do naturally. While economic benefits have an immediate impact on one’s life, environmental impacts have a much more widespread and have more longevity. We need to be concerned about saving every watt of energy possible, even if it means paying a little more money now. If we do not pay the extra money now to conserve the energy, we will likely have to pay a lot more money later in order to compensate for the damage we’ve caused.